HotSpot Shield Review - A lifetime VPN subscription for just $99.99! 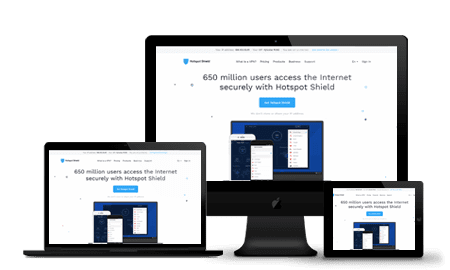 The HotSpot Shield VPN service is developed by AnchorFree, a new company that is already emerging from the shadows of the big players. Hotspot Shield has been built to provide the more casual VPN user with an easy go-to solution for accessing restricted content in complete privacy. The always-on open network protection and unlimited access to geo-specific content mean all the user needs to do is click and enjoy. The straightforward nature of this VPN means it’s more accessible to the novice user. All the VPN jargon and complex information are hidden away, so the user gets a no-fuss experience. HotSpot Shield does have a plan that’s free to use, but you’ll want to opt for the premium plan if you’re looking for more flexibility and speed. Customers can enjoy HotSpot Shield VPN service for free, however it will only enable access to their US servers. It will also prevent users from gaining access to some of the most popular streaming services such as Netflix and Hulu. And as expected, it will be riddled with advertisements. The ads are removed when you opt for the paid versions, and you’ll also get faster service and 24/7 support. It comes at a very reasonable price too if you choose a 2-year subscription, which will cost you only $2.99/month. A one-year subscription is available at a decent price as well at $5.99/month. The highest priced plan is the one-month subscription that goes for $12.99. If you’re on the fence about committing to a full year’s worth of protection, you can try a free seven-day trial of the Elite service. For those who like options, there’s plenty of ways to pay including Visa, MasterCard, American Express, Discover, PayPal, and others. Better yet, HotSpot Shield VPN comes with a 45-day money-back guarantee. HotSpot Shield VPN is packed with tons of features beyond the bare essentials, which make it an attractive choice for many. Free subscribers will get a trimmed down array of features, while the premium plan offers a full menu of useful tools. This should benefit anyone who wants to use this VPN on all their devices. Luckily, you can enjoy a more secure internet experience on up to five different devices simultaneously, all under one HotSpot Shield account – perfect if you’re a member of a large household. It’s vital to have solid bandwidth performance, as this is will impact streaming and downloading speeds. All of HotSpot Shield’s VPN packages come with completely unmetered bandwidth, so you never have to worry about caps. Data logging can seem very intrusive and worrisome. Knowing that your VPN provider has all of your details and activities on file certainly negates one of the main reasons for using a VPN in the first place. HotSpot Shield doesn’t keep activity logs or store your IP addresses. What’s more, they don’t collect any information that would personally identify you. These measures ensure your browsing is truly anonymous. Another great security feature is that you can set up an account without inputting all your personal information. With every VPN, you expect excellent security measures, and HotSpot Shield doesn’t disappoint when it comes to protecting users’ online security and privacy. Hotspot Shield uses an advanced OpenVPN with 256-bit AES encryption. This is a high level of security that keeps snoops, hackers, and Big Brother at bay. Users can enjoy the freedom to explore the internet without worrying who is watching. HotSpot Shield always ensures that no logs of any kind are kept when it comes to web use. As the company owns its personal VPN server infrastructure, they can guarantee users 100% privacy and security since they do not need to rely on third-parties. Users will undoubtedly be satisfied with the level of online safety that HotSpot Shield offers to allow them to access content with complete and reliable privacy. HotSpot Shield’s first point of support is the searchable knowledge base that’s found by clicking the “Support” link on the home page. This displays a list of questions and guides, with the option for users to submit a question to support or on the forum. If you have the Elite version of the VPN, then you get 24/7 support that includes live chat (English only). HotSpot Shield can also be contacted online via Twitter, Facebook, and Google+. If you consume a lot of online media, it’s important to have consistent speed performance. Every VPN claims to be fast and, to be fair, most are. But fast is no good without reliability. On top of its undeniably fast connection, HotSpot Shield utilizes an “always-on”’ policy which treats a disconnection from the VPN as a temporary event. We found that under most circumstances, HotSpot Shield can handle heavy downloading tasks and can handle any demanding streaming services. HotSpot Shield keeps things simple with an elegant, well-presented interface that ensures a simple setup process. Users will be able to get the VPN up and running in moments. All the servers are laid out nicely for easy selection. HotSpot Shield keeps all the techy stuff out of sight, making standard usage simple for both the novice and the well-seasoned VPN pro. Basically, it couldn’t be easier to use. HotSpot Shield offers a fast, easy, and well-priced VPN service to those who want a fuss-free solution. It connects quickly, has a no-nonsense interface that keeps the technical stuff to a minimum, and offers great reliability. Despite its simplicity, it has all the features necessary to enjoy a secure online environment without compromising on speed or performance. It gives the users everything they need in a neat little package. In short, it does a great job for a low price. Dilip is a technology journalist and blogger, with an intuitive understanding of what makes a great piece of consumer software. He may speak tech as a first language, but he’s also an expert at breaking down even the most complex concepts in a way that anyone can understand.